YASKAWA has released two new mobile apps, Drive Wizard Mobile and the YASKAWA Manual App which eliminate the need for carrying a PC or printed manuals. The Drive Wizard app greatly simplifies set-up, monitoring and diagnosis of the GA700 range of drives while the Manual Reader provides users with full access to the latest GA700 manuals via a mobile device. 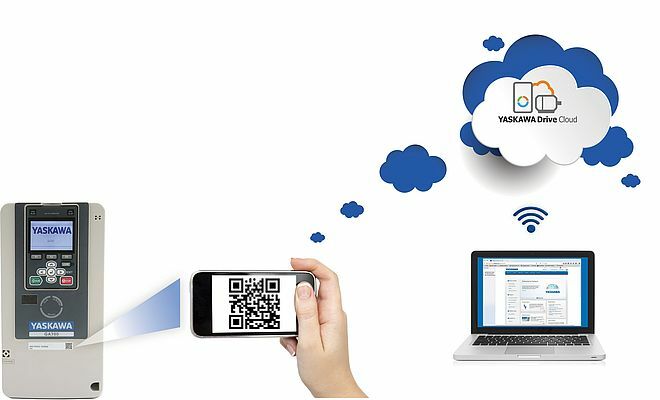 Both of these apps and the Cloud services currently offered by YASKAWA are completely free of charge and can be accessed simply by scanning QR codes supplied, then following the links to Google Play. Alternatively, they can be found by opening Google Play, searching for ‘Drive Wizard’ and ‘Yaskawa Manuals’. The Drive Wizard app offers users a wide range of features and benefits such as: drive set-up, online monitoring and diagnosis with parameter details like descriptions, setting range, defaults etc. at a glance. Also, motor auto-tuning from a smart device, detailed alarm / fault descriptions and counter measures. Connection is by Bluetooth or USB via a BT keypad or USB-on-the-go adapter and cable. It is usable offline without internet connection.